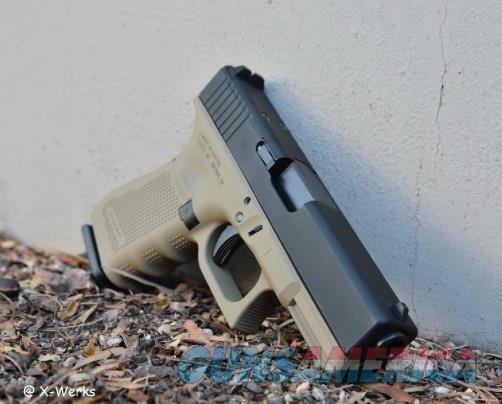 Description: New in box X-Werks Coated Glock 19 Gen 4 MOS chambered in 9mm. This model features the newly release milled slide that allows a red dot to be mounted to the slide!! This pistol has an Armor Black Cerakote finish to the Slide and a Coyote Tan Cerakote finish to the Frame from us here in house! We are a professional finishing company located in Phoenix, AZ. This model also features all the Gen 4 improvements and comes with 3 15rnd magazines, 4 different mounting bases (not coated), 4 back straps (not coated), lock, loading tool, and Glock case..
Shop online at X-Werks.com and follow X-Werks on Facebook for Updates and specials!! Please allow 2-4 business days for items to ship once payment and FFL are received. Give us a call, stop by our shop, or email us with any questions! We're open M-F 9a-6p and you can email or purchase online anytime! FFL's can be emailed, faxed or mailed to us. Please reference your name and the item number to prevent any delays in shipping. Long guns and accessories ship UPS Ground. Handguns are shipped USPS priority mail. Once payment and FFL are received we will email you a tracking/delivery confirmation number. X-Werks specializes in High Performance coatings and fabrication for the Firearms & Motorsports Industries.